Model rescue horse Riley during a training exercise, in which he is stuck on a fence. Riley will be the star of next month’s International Large Animal Rescue Conference in Australia. 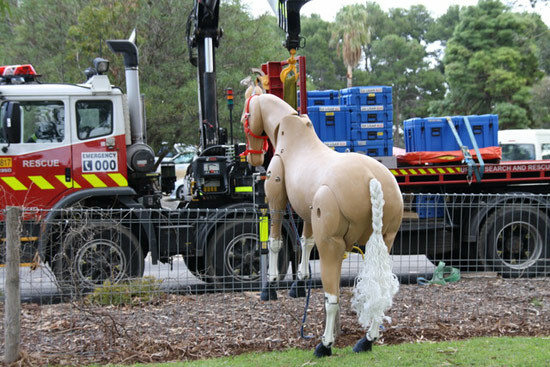 Horse rescue experts are converging on Adelaide next month for the International Large Animal Rescue Conference. It will be the first time the conference has been held in the Southern Hemisphere. Experts in the field from the UK, USA, New Zealand, Australia and Thailand will gather on November 2 and 3 for the conference at the University of Adelaide’s, Roseworthy Campus in Australia. There are four themes for this year’s conference: Rescue, Animals in Disaster, Livestock Transport and Event Incidents. The three keynote speakers are Jim Green, of the British Animal Rescue & Trauma Care Association, Dr Rebecca Gimenez, of Technical Large Animal Rescue in the USA, and the WSPCA’s Disaster Management Operations Director for the Asia-Pacific Region Dr Ian Dacre (Thailand). Horses get themselves into all sorts of sticky – and dangerous – situations. They are supported by experienced presenters including Royal Veterinary College Professor in Equine Clinical Studies Josh Slater (UK via Skype), Massey University’s Professor of Equine Clinical Studies Professor Christopher Riley, and Massey’s Veterinary Emergency Response Team Leader Hayley Squance (NZ). Dr Christine Smith, Dr Chris Heislers, Dr Peter Horridge, Dr Mark Peters, Dr Kirrilly Thompson, Anthony Hatch, Maryanne Leighton, David King and Raylene Garwood provide the Australian viewpoint. Large Animal Emergency Rescue is the response phase of a natural or man-made disaster, or accident, where specialized training and equipment are required to rescue a large animal such as a horse, alpaca or cow. When an animal is trapped in a hole, by wire, in a road crash or mud – it can easily revert to the inbuilt “fight or flight” responses regardless of the age, training or breed. This especially applies to horses. Without the skills and knowledge associated with Large Animal Rescue techniques, the animal is likely to become more injured during the rescue than the initial accident caused in the first place. The people rescuing the animal often put themselves at great risk injury or worse, often without realising it. The conference will feature presentations and demonstrations, some involving a life size fully articulated horse recently imported from the UK, affectionately called “Riley”. Light Regional Council, Resquip and Safety Access & Training Australia are major sponsors. Registrations are now open for the conference, which is being organised by Horse SA, a not for profit community group working for all horse owners. During the conference, the Sheri Holmes Memorial Award for Technical Large Animal Emergency Leadership will be awarded. This recognizes a person or group who has been involved in Technical Large Animal Emergency Rescue work for a minimum of 10 years; who consistently demonstrates innovative techniques, tactics and equipment for response; and whose motivational leadership impacts their work with students, with emergency rescue work, and/or within the community environment. For more information and to register, see www.horse.org.au, or call Julie Fiedler on 0402488306, or horsesa@horsesa.asn.au.